Oregon Rx Card works hard to provide for the children and families that are being treated at PeaceHealth Sacred Heart Medical Center. The partnership between PeaceHealth Sacred Heart Medical Center and Oregon Rx Card helps create awareness for the Rx savings program and helps raise money for the hospital at the same time. A donation will be made to PeaceHealth Sacred Heart Medical Center each time a prescription is processed through Oregon Rx Card. We are excited to be a supporter of PeaceHealth Sacred Heart Medical Center and all the patients they help. 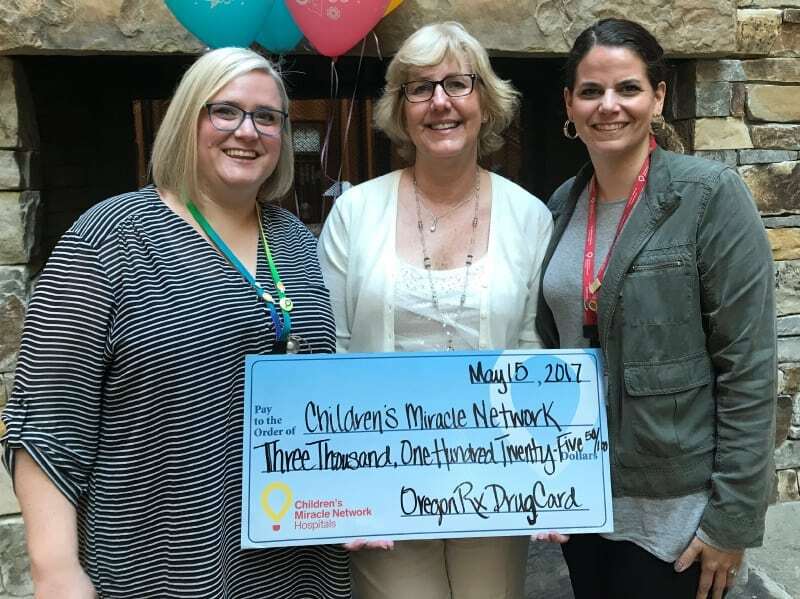 Attached is a photo of Oregon Rx Card representative (middle) along with Alexa Sharpe and Abby Rogers with PeaceHealth Sacred Heart Medical Center on May 15, 2017. Since 2015, the United Networks of America partnership with Children’s Miracle Network Hospitals has raised over $2.4 million dollars for local children’s hospitals. Of this, $3,125.50 has been raised for PeaceHealth Sacred Heart Medical Center.